George Armstrong Custer - a controversial figure in life and death. He represents American values and attitudes which change over the decades. Custer has appeared as a character in over 70 films and TV movies. 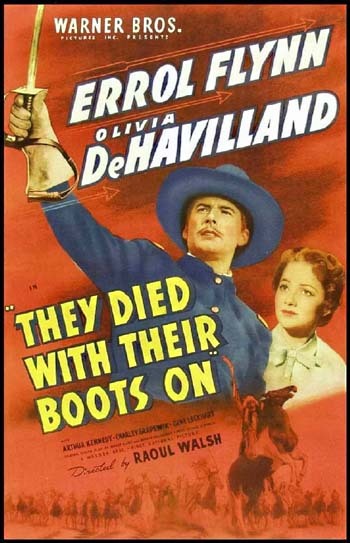 The two best-known portrayals can be found in the two best movies featuring the man: Raoul Walsh's 1942 They Died With Their Boots On (1941) and Arthur Penn's 1970 Little Big Man. Both movies, three decades apart, use Custer and his troops to make contrasting points about America itself when two overseas wars were raging at the time each movie was made. 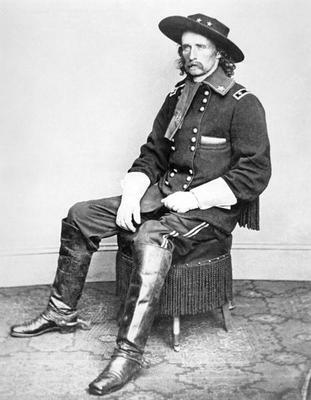 "Whether Custer is a hero or a villain, a major character or a minor supporting player, his buckskin jacket and long hair are immediately recognizable. For some these objects represent the white man's sins; for others they are the visual representation of heroic legend and myth. Custer's appeal on a medium like film is obvious; he is the most adaptable of visual symbols that represent the American West. Villain, hero, fool, misunderstood warrior, whatever the times have called for, filmmakers have molded George Custer into the figure that best suited their needs. There is no reason to think that will change in the future." The fascination with Custer for almost a century and a half can be seen in the amazing variety of portrayals of the man. He has been depicted, not only in movies but in statues, magazines, novels, historical accounts and articles, war games, computer games, wild west shows, political speeches. 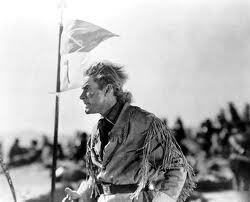 He remains a metaphor for the American military, American expansionism and imperialism, the American treatment of Indians and above all of America itself. Top row,left to right: Wild West show banner; magian cover (1976); Walt Whitman's poem about Custer and LittleBighorn. Middle row: one of the best recent historical accounts of Little Bighorn; Dime magazine cover; postcard. Bottom row: cover of revisionist account of battle; French movie poster of "They Died With Their Boots On"; statue of Custer in Monroe, Michigan. Below: copy of famous Brewery firm's depiction of an heroic Custer fighting until the end. This was once hung in countless saloons, stores and boarding houses and even homes. The painting was commissioned by the brewers in 1884 and converted into the lithograph below in 1887. Two different Custers for two different ages (and wars). Plus Ronald Reagan as Custer! Custer, warrior-hero in "They Died With Their Boots On". Custer as brave leader, good husband and protector of the Indians from the predatory goldminers out to get their lands..
Custer as preening, vainglorious and ambitious nincompoop in Arthur Penn's 1970's revisionist "Little Big Man". A rare example of a great novel being made into a great movie, while providing insights into the American counter-culture of the time. In "Santa Fe Trail", Ronald Reagan (left) is a genial Custer, hero Errol Flynn's good buddy and his rival for Olivia de Havilland. The movie has nothing to do with Little Bighorn and very little to do with the Santa Fe Trail.